Durable gold anodized/polished fiberglass omni-directional antenna. 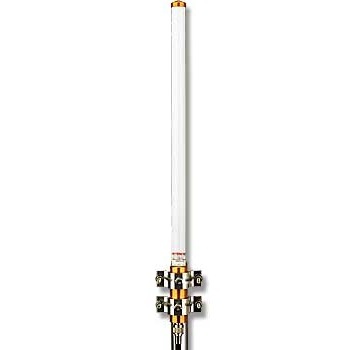 AntenexÃ‚Â® Gold Fiberglass Base Station antennas are collinear designs enclosed in a high density fiberglass, which is covered with a protective ultraviolet inhibiting coating. The radiating elements are made from high efficiency copper and are carefully phased to provide maximum gain in the horizontal plane. The mounting sleeves are tuned to eliminate RF currents from the transmission line resulting in a cold sleeve allowing great freedom in mounting. This high quality and well-focused beam provides the highest gain and best efficiency. Every FG fiberglass base antenna is tested on a network analyzer before shipping to assure the best VSWR performance. FMW4-YMST4: Antenex 4' x 1-1/4" Aluminum Mast and 4" Standoff Wall Mounts (2 Brackets).